In the summer of 1990, RAINER put an ad in a newspaper ("singers wanted for a cappella ensemble") and got to know SILVIA and TINO. 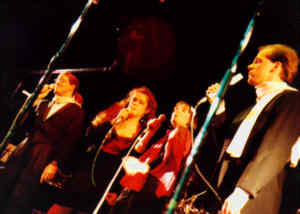 He had already sung in another ensemble with MARTINA ("Jazzline"), which he had founded in 1988. The a cappella ensemble "Jazz by 4" was born. The four started to work on a diversified repertoire of songs for unaccompanied voices. The first objective was a concert at an open house concert. In January 1990, "Jazz by 4" debuted in the canteen of the Heinrich-Heine University in Düsseldorf. 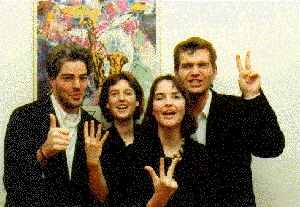 ...the first members of "Jazz by 4" (from left to right): Rainer Deußen, Martina Schlangen, Silvia Twardawa ("Hallöchen"), Tino Hendricks. This picture was taken during the open house concert at the Heinrich-Heine-Universität, Düsseldorf. While attending a concert of the a cappella ensemble "Tiezes" REINER saw an ad "Tenor wanted". He met the others and soon "Jazz by 4" had a new tenor and conductor. SILVIA introduced ANGELIKA to the ensemble. The second "Jazz by 4" formation extended the repertoire and started singing mainly at private festivities. 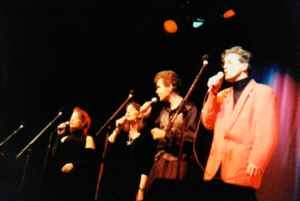 The next "cast" of "Jazz by 4" (1991-1992): Rainer Deußen, Angelika Krummeck, Silvia Twardawa, Reiner Kühl (from left to right). This picture was taken while practising in Silvia's flat. In 1992 RAINER joined the cover band "Shake the Sheik", in which ULI sang. He introduced ULI to the vocal ensemble and, thus the third "Jazz by 4" formation was brought into being. After that, bigger concerts followed (e.g. in the Zakk in Düsseldorf) for example together with the a cappella ensemble "Mint Juleps" from London. The third "Jazz by 4" formation (from left to right): Ulrike Trost, Silvia Twardawa, Reiner Kühl, Rainer Deußen. This picture was taken during a concert at the Zakk in Düsseldorf. In addition to "Jazz by 4" REINER also conducted the a cappella ensemble "Das Chörchen" in Cologne. CONNY and THOMAS who were members of this choir joined the ensemble and thus created "Jazz by 5". 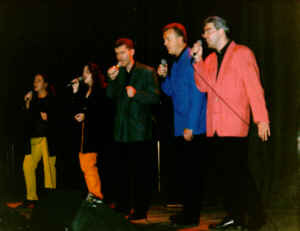 Finally "Jazz by 5" (since 1995) (from left to right): Conny Gust, Ulrike Trost, Reiner Kühl, Thomas Mäling, Rainer Deußen.